With a custom 11-string Harp-Guitar he performs his post-industrial folk songs from coast to coast. Combining literary songwriting with virtuoso guitar playing, he is part rabble-rouser, part renaissance man, always impressing audiences with the immediacy of his songs, and the power of his presentation. “I have an agenda with this music… to move culture, in a way…. 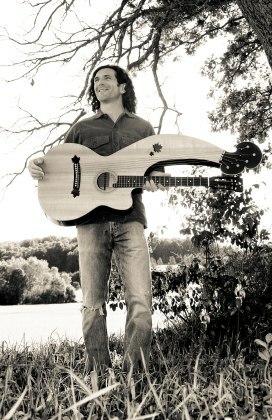 William studied fingerstyle guitar with Windham Hill Records founding artist Alex deGrassi, and has performed with modern folk luminaries like Brooks Williams, Langhorne Slim, Pamela Means, and Larry Keel. An energetic, engaging performer, cheerfully jumping genres from jazz and swing to folk-rock and more. Audiences of all ages and tastes are awestruck by this artist’s grace and groove.